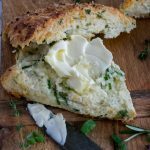 Savory Spinach Ricotta Scones - What the Forks for Dinner? Savory Spinach Ricotta Scones - What the Forks for Dinner? Whisk together flour, baking powder, sugar, and salt in a large bowl. Using your fingers(best tools ever), work the grated butter into the flour mixture until the consistency of coarse meal. Stir in scallions, spinach, and fresh herbs. Add ricotta cheese, then add cream and stir until just combined. Turn dough out onto a lightly floured surface and knead 2 to 3 times. Shape dough into a 9-inch circle. Slice into 8 wedges. Transfer scone wedges to a parchment-lined baking sheet leaving space between the wedges. Brush tops liberally with egg wash. In a small bowl mix together the seas salt, pepper, and smoked paprika. Sprinkle tops of egg washed scones with salt mixture, as much or little as you like. Bake for 30-35 minutes or until scones is golden brown.